The 1940 census includes fields for the person's residence in 1935. The fields are city, county, and state. 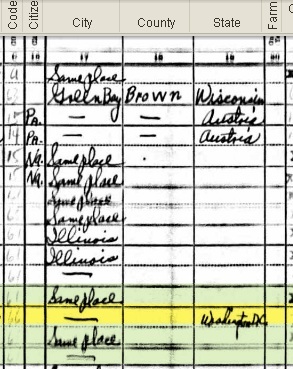 When it says "same place" for the residence in 1935, does that refer to the town or to the house? In some cases, such as below, it also shows the name of the state in the "city" column. What can I infer reasonably from the "same place" entry? The answer to this is in the column header right on the census page :) There are various instructions in the column headers as well as at the very bottom of the census pages. IN WHAT PLACE DID THIS PERSON LIVE ON APRIL 1, 1935? For a person who, on April 1, 1935, was living in the same house as at present, enter in Col. 17 "Same house," and for one living in a different house but in the same city or town, enter, "Same place," leaving Cols. 18, 19, and 20 blank, in both instances. Not the answer you're looking for? Browse other questions tagged united-states census-records 1940s residence or ask your own question. Finding non-resident schedules and absent household schedules for the US Federal Census? What WPA projects took place in my (or my relatives') hometown? Standardizing place names when city sprawls across county borders?